These terms and conditions are between and shall bind the property owner (“we”, “us”, and “our”) and the holidaymaker(s) (“you” and “your”) who book our property (the “property”). 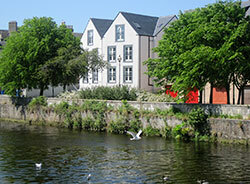 A booking can be requested by completing the Booking Request Form available on the property website (“property website”) (www.riverbanknairn.co.uk). Your submission of the Booking Request Form on behalf of all the persons who will occupy the property will confirm that those persons are aware of these terms and conditions. Bookings can only be made by persons of at least 21 years of age. Bookings are accepted by us on receipt of a deposit (the “deposit”) payment of 20% of the total rental cost (“the total rental cost”), or the total rental cost if less than 8 weeks from your arrival date, and on receipt by you of a confirmation of booking email (“confirmation of booking email”) from either us or our agent(s). We reserve the right to decline any booking request. The balance of the total rental cost plus a damage deposit (the “Damage deposit”) of £100 are due 8 weeks prior to you arrival date. If the total rental cost is not received by 8 weeks before your holiday arrival date then we reserve the right to cancel your booking. YOU ARE ADVISED TO TAKE OUT HOLIDAY INSURANCE WHICH INCLUDES HOLIDAY CANCELLATION. Cancellations must be notified to us in writing to the email address provided on your confirmation of booking email. If a booking is cancelled by you less than 4 weeks before your holiday arrival date no refund will be made. If a booking is cancelled by you more than 4 weeks before your holiday arrival date, and you have paid the total rental cost, then 50% of the amount paid will be refunded. If a booking is cancelled by you more than 4 weeks before your holiday arrival date, and you have paid the deposit only, then no refund will be made. In the event of cancellation we will endeavor to re-let the property and if we are successful then we will refund any amounts paid by you in excess of the deposit. Cancellation or the change to your booking. If we cancel we will refund to you any amounts you have paid to us. However, we will not be liable to refund you for any fees you may have paid to any third party in connection with your holiday (including, without limitation, fees for travel, entertainment, activities or insurance).You will have no further claims against the owner. The property will be available from 4pm on the day of arrival. Guests must vacate the property by 10am on the day of departure. The number of adults and children using the property must not exceed the numbers shown on the property website (plus a maximum of 2 infants in travel cots). You shall not use the Property for any commercial purpose. The Owner reserves the right to terminate without notice and without refund for a breach of this condition. You hereby undertake to indemnify us for any damage to the property caused by the actions of any person staying at the property during the period of your booking. You agree to allow us or any representative of ours access to the property at any reasonable time during your stay for the purpose of essential repairs, in an emergency or to ensure you are complying with these terms and conditions. We may cancel the booking and take back possession of the property and its contents if we reasonably believe that you are in breach of a material condition of these terms or that damage is likely to be caused, has been caused or is being caused by you or any members of your party. This will be treated as a cancellation by you and no refund of any monies paid in respect of the booking will be made. We shall not have any liability for any losses suffered as a consequence of the cancellation. We do not accept any liability in relation to any damage to, or loss of, your personal property and belongings except where the damage or loss is caused by our negligence. It is your responsibility to ensure that you have adequate holiday insurance cover. Lost property will be held for 14 days and then handed to a local charity shop or a recycling centre unless we have been contacted by you with proof of ownership. You are required to pay a damage deposit of £100 with the final payment. You must advise the owner or their agent, prior to your departure date, of any breakages or repairs to the property. The damage deposit will be held to cover any losses, damage and additional cleaning charges that may arise if the property is left in an unsatisfactory condition. Charges for extra services may be deducted from this. The deposit less any deductions will be refunded within fourteen days after the departure date. Smoking is not permitted anywhere inside the property or the building within which it is contained. The use of candles is not allowed in case of fire. Bedding, towels and kitchen linen are provided with gas and electricity included in the total rental cost. We shall have no liability for failure to perform any of our obligations if such failure results from events, circumstances or causes beyond our reasonable control (such as a breakdown of domestic appliances, internet access, plumbing or wiring or exceptional weather conditions). We shall have no liability for any death or personal injury unless this results from our negligence .Our total liability in respect of any losses arising in relation to the letting of the property shall not exceed the amount paid by you. These conditions and any dispute or claim arising out or in connection with its subject matter shall be governed by and construed in accordance with the law of Scotland.